Battlefleet Gothic: Armada 2 is a real-time strategy game based on the tabletop game from Games Workshop and lets you command huge fleets in the vastness of the Warhammer 40k. Get up to speed with the game in our handy recap guide while you wait for the launch later today. What is Battlefleet Gothic: Armada 2? In space no one can hear you scream, well almost no one. 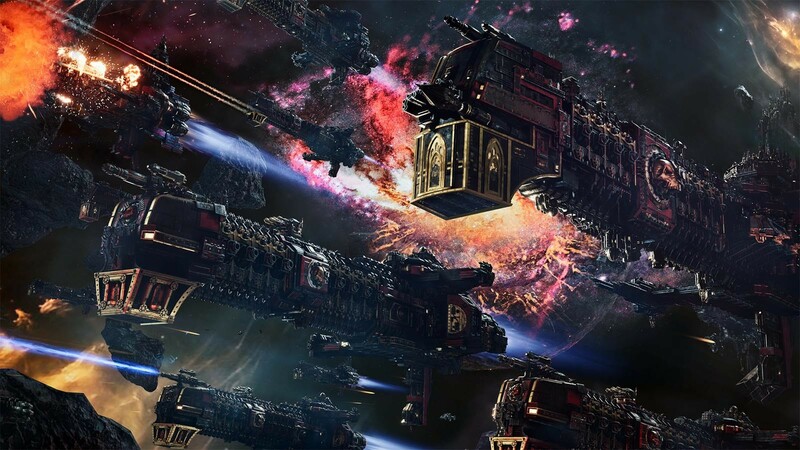 In the upcoming Battlefleet Gothic: Armada 2 the huge explosions of battle will be heard a few galaxies away. This new strategy sequel from publisher Focus Home Interactive and developer Tindalos Interactive will deliver an even more engaging experience than before. The setting for the game is based on the Warhammer 40,000 story the Gathering Storm and the 13th Black Crusade. Abaddon, the Destroyer has successfully brought down Cadia during the 13th Crusade and the galactic forces are split. You find yourself as a Fleet Commander in the midst of a dangerous warp storm, having to forge new alliances, destroy enemies and plan your tactics carefully in order to survive against foes. The game will offer 3 huge campaigns with more than 100 hours of play, each one will tell the tale of a different faction through the Warhammer universe of Battlefleet Gothic: Armada 2. Compared to the Predecessor, the sequel offers even more content with larger fleets, ships, and opportunities to turn the tides in battles. All 12 factions of the Games Workshop tabletop template are present in Armada 2: Imperial Fleet, Space Marines, Adeptus Mechanicus, Necrons, Chaos, Eldark Corsairs, Eldar World Ships, Dark Eldar, Tau Trade and Protection Fleets, Orcs, and finally the Tyranids. In the campaigns you take command over the Empire of mankind, the Necrons and the Tyranids. Looking for a recap on all Battlefleet Gothic: Armada 2 trailers, gameplay videos and other videos you've missed? We've put together a playlist for all that below! We are currently aiming for a 6PM CET / 5PM GMT / 12PM EST / 9AM PST launch, but stay tuned as we may do a soft release a few hours earlier to make sure everything is working as expected. Make sure your system is up to the task of running the game with the PC System Requirements for Battlefleet Gothic: Armada 2 below. We'd also recommend making sure you have the latest drivers for your Graphics Card to ensure the smoothest experience at release - AMD / Nvidia. Problems with Battlefleet Gothic Armada 2? We're here to help! Getting a new game is an awesome experience and we want to make that as trouble free as possible, so we've put together a guide of common troubleshooting problems and FAQ's to help you out with Battlefleet Gothic Armada 2 on PC. You can find our Help Topic here.